We train the future of Archery! 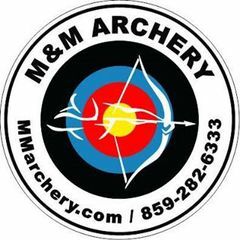 M & M Archery Range features all the products and services you expect from Northern Kentucky's only family friendly indoor archery range and pro-shop. We offer several training and fun programs for both Youth and Adult! Come practice on our 3D Target or the NFAA Indoor Range and enjoy our 20 lane 40 yard indoor archery range in the Northern Kentucky area. 1. Repairs on all Compounds, and Crossbows. 2. Full line of high quality Bows, Recurves and Crossbows. 3. Full line of accessories, arrows, sights, quivers, release aids. 4. Bow tuning and service for all compound, Recurve, and Crossbows. 5. On site custom Arrow center. 6. 20- lane, 40 yard indoor archery practice range and Rinehart 3D range. 7. Archery leagues for adults, children and families. 8. Lessons and training for beginners to advanced of all ages. 9. Bow rentals for youth and adults. 10. Range rental for special events team building and birthday parties. 11. Education and training classes for hunting and archery. 12. On site repairs and tuning on all brands or archery equipment. 13. Crossbows are always welcome. 14. Hunters education and Bowhunting classes.